Tangy, luscious and irresistible. This is how I remember amrakh, or Averrhoa carambola that I relished as a child. The juicy green star fruit, named so for its shape, would always find its way to the vendor’s basket along with tamarind, guavas and ber. It is now common in upscale markets where it is often used to garnish sweet potato chaat. In Delhi, star fruit used to be cultivated in Shalimar Bagh, a garden built in the northern part of the city by Mughal emperor Shahjahan. Shalimar Bagh was once home to several mango, guava, ber and star fruit trees. These were given on lease for fruit collection. Only a few of these exist now due to water shortage and encroachments. Their yield has reduced and there are not many takers. 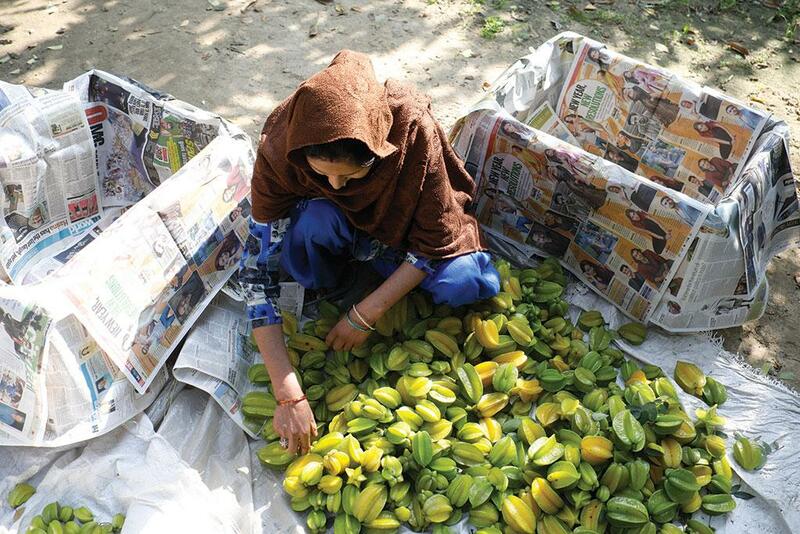 In Sambhal, 200 km from the national capital, small copses of star fruit trees growing in mixed orchards still exist. Chanchal Srimali, who owns a few star fruit trees in Sambhal, says it fetches Rs 7 per kg in the local market. In Delhi’s Azadpur mandi, it costs Rs 20 to Rs 40 per kg depending on the demand, says a chaat vendor at an upscale market in South Delhi. But the fruit’s full potential has not been explored and exploited in the country as yet. The star fruit tree belongs to the Oxalidaceae family, commonly known as the wood sorrel family. Its leaves are divided and the leaflets show sleep movements. They open up during day and close at night. In India, people use star fruit in pickles or as a souring agent in their chutney. When unripe, the fruit can be cookd as a vegetable, while the ripe and sweeter version is used to make unfermented drinks and jams. In Surinam, people process the ripe fruit to make wine. In southern China, it is cut into thin slices and preserved. Star fruit is a one-stop medicine shop as well. According to the traditional Indian medicinal systems, its consumption can treat haemorrhage. The dried fruit or the juice extracted from ripe fruits can cure fever. In Brazil, the fruit is recommended for eczema. According to the Chinese, consumption of star fruit can quench thirst and increase salivary secretion. It also treats hangovers. Srimali often gets requests for unripe fruits from diabetes patients, as it controls glucose levels in the body. However, kidney patients should refrain from eating this fruit because it contains oxalic acid. Its consumption can cause intoxication and loss of consciousness in them. A study published in 1980 in the Medical Journal of Malaysia showed that fruit extracts when injected in doses exceeding 8 gm per kg of body weight provoked convulsions and even death in mice. The problem is not likely to arise in people if they consume the fruit in small quantities. People not suffering from kidney diseases are not at risk. However, the strong sour taste makes it impossible to eat it in large quantities. The star fruit has an international presence. In fact, its scientific name is inspired from Averroes, an Andalusian astronomer and philosopher, who lived in southern Spain in the 12th century. The fruit is believed to have originated in Sri Lanka and the Moluccas, and then spread across the world. It was introduced in southern Florida in the 1880s where it was used to decorate gift shipments of citrus fruits. It was added with other fruits as a novelty piece. In the United States, star fruit is popular among health conscious people. They add it to their salads to get a good dose of vitamin C and anti-oxidants. It is a low-calorie food high in dietary fibre. With its myriad uses and health benefits, the fruit is, no doubt, a star. Cut the fruit into thick slices. Add salt and wait till the fruit releases water. Remove the water and save it for later use. Add kalonji, chilli powder, fennel seed powder and mustard seed powder to the fruit slices and transfer the contents to a glass bottle. Add the salt water kept aside. Cover the pieces with mustard oil and keep them in the sun for two to three days. The pickle is ready to eat. Grind all the ingredients together on a sil batta (grinding stone) and the chutney is ready to eat. Relish with samosas or pakoras (fried fritters).